Have you ever walked on a path in the forest in the middle of the night without a flashlight? If you have and there wasn't a full moon shining, it is a pretty difficult thing to find your way around. Without a light to guide the way, you will inevitably go off the path and at the very least, bump into a tree. I believe the psalmist in today's promise is saying the same thing about the importance of God's Word for you and me. In the grand scheme of things, we are only little boys and little girls who need all the help we can get. We do not have the navigational tools to manage our own life. We need both the written Word of God and the timely spoken Word of God to guide us through this life. It is comforting to know that our God and Father equips us with all we need to live a godly life including lighting our path as we take one step at a time. 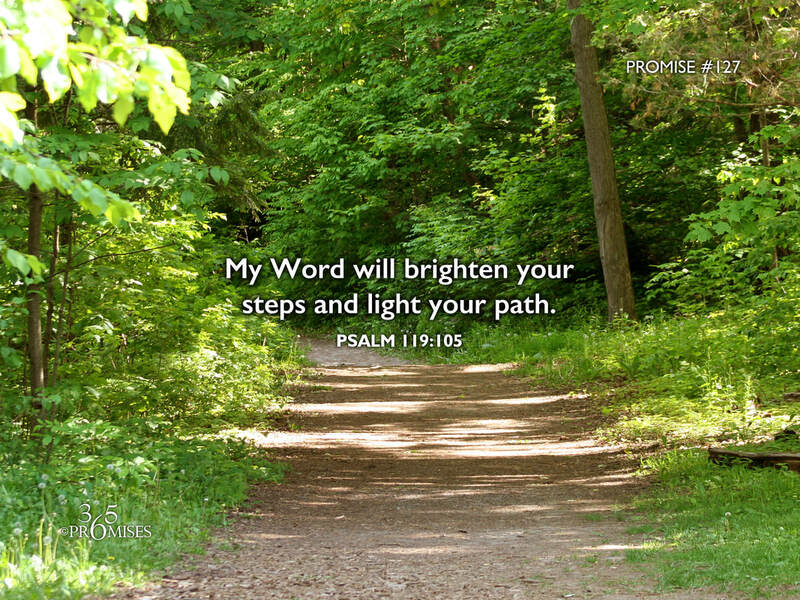 Notice that the psalmist doesn't say that God's Word lights the path miles in front of us. He says that God's Word is a lamp unto our feet. May each one of us rejoice in the fact that God has committed the resources of heaven to guide us on our life's journey. He has not left us in the dark to try to fend for ourselves, but has focused His Word like a huge beam of light at our feet to guide every step we take.